The night before Peter’s funeral I went to visit his studio, and next to the bare canvas set up for his newest painting were two misspelled handwritten signs: “I hope you’re not postponing because of fear” and “Explore the limits of failure.” These were the personal gospels that kept him going. His studio — with his boxes of green tea and soymilk and every CD, from Leonard Cohen and Nirvana to all the gay icons like Judy Garland and Barbra Streisand, and his two new, gorgeous, nearly finished paintings — looked like he’d just stepped out for a few minutes to buy more bananas. It made it even harder to grasp that we’re here together to mourn this sudden and totally unexpected loss of Peter. Peter left New Jersey twenty years ago for New York, where he developed a second family in the art world and the gay community. Although I was not one of his closest friends, like many of you sitting here today I am part of that community and that family. And although I didn’t know Peter as long or as deeply as many of you, like Craig or Fernando or Jack, he touched me deeply, and we had a mutual love and respect. So did many people, even those who knew him only slightly. Peter was very special. He was our all-American boy, a dreamboat — shy, quiet , self-contained. The other day in San Francisco somebody said to me, “You know, in all the talk about Peter Cain nobody ever mentioned to me how good-looking he was.” I think his physical beauty was extremely appealing in this very typical American way — the perfect American boy. Although he was a bit withdrawn and he claimed to be anti-social, he was known for his great sense of humor. His dry wit was without malice, and he was incredibly kind and generous and without pretense. In spite of his solitary nature, he inspired enormous loyalty in people, both in his long-term friendships — like with Frank — and his art-world colleagues, including his more recent friendships. For someone who by nature was so proud of his work, he shared a lot of himself in making and showing it. It was an act of generosity and his form of communication with the world. In the art world, as in his personal life and comportment, he maintained total integrity. He never compromised his vision or methods for success, as much as he may have wanted it. Yet he achieved it. His work came slowly, and he was never prolific, but it engendered enormous response both in critical acclaim and in the respect of other artists. He was generous and supportive of other artists. In my case, it was because of him that Matthew Marks took me on as my dealer. When Peter first gained exposure in the art world in the early 1990s, he began to fear self-sabotage, and he became part of the sober community, which supplied him with a spiritual life and some of his closest friendships. He fought hard to maintain that sober state of serenity. Even a small amount of time spent with him affected each of us deeply, because he was so unassuming, so unpretentious, but had such clarity and insight that he cut right through to the heart of the matter. I first saw his paintings at Simon Watson Galley in 1991 and was impressed by the maturity of his technique. He painted cars over and over — mutated hybrids suspended upside down. He used the ultimate American icon as his vocabulary for abstraction the way an earlier generation of painters drew from nature or the figure. He was an expert draftsman, and his vision was absolutely his own, twisted and hallucinatory, altering the viewer’s own sense of perspective. He was obsessed with trucks and cars as a flat surface reflecting the mundane landscape of the American highway. In his close-up portraits of cars’ faces, like an enormous Cyclops, he buried the American dream immobilized by unfulfilled desire. But he himself viewed the paintings as abstractions, and he idolized the work of Guston, de Kooning, and Brice Marden. He spent the day before his cerebral hemorrhage in bed with the flu watching all the videotapes of de Kooning painting in his studio. His career blossomed in the past seven years. Introduced by Paul Morris, Matthew Marks catapulted him into high visibility. He was one of the first artists Matthew worked with, and Matthew’s loyalty and love for Peter far superseded the normal artist/dealer relationship. He understood Peter’s idiosyncrasies, and he gave him the support to work unhampered these past years. 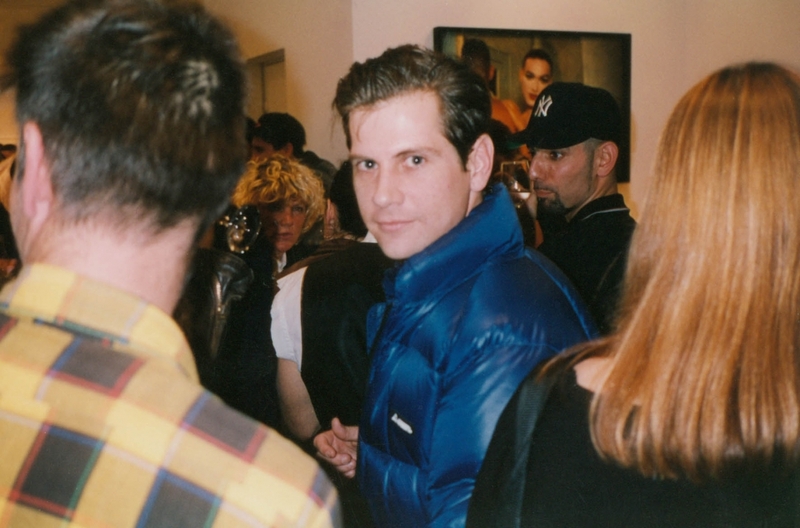 Peter exhibited in New York, Los Angeles, San Francisco, two Whitney Biennials, the Venice Bienniale, Milan, London, Japan. Each show he had inspired an unusual amount of reviews and critical acclaim. But it was in his new work that he was really emerging into the great artist he was promising to become. The last two years he did a series of drawings and paintings that to my mind were his best. He began to paint his lover, Sean, who he was with for the past three and a half years. For the first time he painted a person. Flesh replaced chrome, and the new work had an added dimension of vulnerability, tenderness, and emotional attachment. He painted Sean over and over based on a series of photographs he had taken of him on Valentine’s Day in 1994 in Key West, six months after they had met in Fort Lauderdale, where Sean was in a punk band. Like his cars, Peter rendered Sean in an extreme close-up. Close to the touch — the monumental boy as an icon. A love poem, American-style. It is a testimonial to their love that Sean left Florida for New York to live with Peter, and every time the neighbors in the studio downstairs got too loud, they discussed their plan to move to Los Angeles together. It was Sean who took Peter to the hospital. We all sat vigil for four days and nights as two families separate yet mutually respectful, each praying in their own ways for the recovery of their Peter. I will never forget those days in the hospital. His original family with their solidarity and loyalty in the face of terrible fear, and their warmth and openness to us even in their pain. I will never forget the sight of Frank and Josh silently meditating and all of us sprawled in the hallways holding each other up, and of Matthew’s father, Dr. Marks, supervising his medical care around the clock for those prolonged days. And then, against all our hopes, we lost Peter. I think he would have been deeply pleased to see how much and how many people loved him and to watch us holding each other up. And he would have been amused to watch the splinters and the differences between us become healed by our common pain and struggle to help each other survive our loss. At thirty-seven it was much too soon for Peter to have died. All of us here feel the depth of the loss of his quiet presence among us, the twinkle in his eye, and his ability to make us laugh. And it is a great loss for the world at large of a young artist who was fully coming into his own and who had the generosity to share it with us.